Small and medium-sized enterprises (SMEs) have played an important role in South Asia and remain a critical source for employment creation as well as income generation. SMEs occupy an important position in the development strategy for inclusive economic growth and poverty reduction. In this respect, export-oriented SMEs, supplying competitive products and services with greater potential for backward and forward linkages, would substantially contribute towards higher national income and overall socio-economic progress of nations. Therefore, the development of export-led SMEs should be promoted through effective policy options in South Asian countries. However, SMEs in the subregion typically face considerable resource constraints and currently have limited capabilities to compete effectively in global and regional markets. It is thus imperative to further expand SMEs’ capacity and competitiveness for survival and sustained development, particularly in the current competitive business environment. Furthermore, one of the most crucial challenges facing SMEs in South Asia is how to create new business opportunities in the global and regional markets. Domestic SMEs can access international markets through global (and regional) value chains (GVCs), which provide a full range of value added business activities across borders. In order to participate in GVCs effectively, SMEs in South Asia must remove entry barriers by developing capacities in a wide range of increasingly stringent international standards with regard to quality, price and timely delivery of products. However, SMEs typically lack an environment that would allow them to improve their capacity and competitiveness. 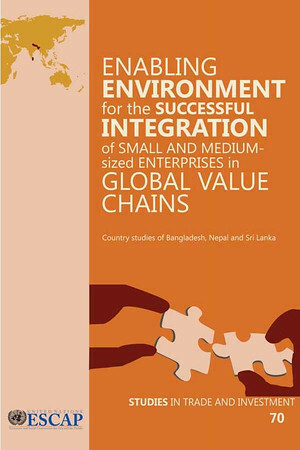 This publication aims to propose practical policy interventions in improving business environment by targeting three South Asian countries, namely Bangladesh, Nepal and Sri Lanka and facilitating SMEs access to global and regional markets, especially through GVCs.